Have you ever felt like you were trying to run from something? When I was young, the thought did enter my mind to run away with the circus. Even if I may never be accomplished enough to swing on the trapeze or tame the lions, at least I could still muster enough courage to play the Clown. (Come to think of it, being a priest sometimes feels like playing the clown) Statistics show that the majority of missing/runaway children do so due to family conflicts and peer pressure or influence. Whatever pain or suffering a young person may have had to endure to compel him to run away from home, can never match the pain, loss and guilt of those who are left behind. One of the greatest traumas imaginable is when parents have to deal with a missing child. But running away or the temptation to run away, is not just confined to kids or adolescents. Adults do it too, or at least contemplate the possibility of being able to run away from either an unhappy marriage, from financial crisis or insurmountable debts, from responsibilities, and even from God. It is true that you can run away from almost anything. But when it comes to God, I'll let you in on a little secret. It doesn't work! It is interesting to note, that the gospel passage chosen for this year’s Feast of the Holy Family deals with a crisis that threatens both the sanity of frantic parents over the prospect of losing a child and the possibility of tearing the very fabric of family life apart. But like any other crisis, this story shows us that a family crisis does not need to end in disaster. The story of our Lord being lost in the Temple is different in a number of significant ways. First, let us remember that this is the only recorded incident in the youthful years of our Lord. Other than this incident at the temple when our Lord was 12, there is no other biblical record of any incident in the growing-up years of Jesus. Second, in this account are recorded the very first words of our Lord Jesus. Many of our Lord’s words were recorded from His later ministry. But the words of our Lord in this text are His first recorded words, and very important words they are indeed. Third, this is the last time St Joseph is ever mentioned in the life of our Lord. It is commonly felt that St Joseph must have died sometime after this incident, before our Lord began His public ministry. Finally, the actions of our Lord, in the minds of His earthly parents, Mary and Joseph, appeared to be wrong. If this child were any person other than Jesus, we would all agree that He deserved a spanking. The story weaves together several threads. The first thread can be found in the context of this story – it is a family pilgrimage to Jerusalem indicating the faith and devotion of the Holy Family and how our Lord was nurtured and instructed in faith by His parents to observe not just the precepts of the Law but to live up to the demands of loving God with all His heart, mind, soul and being. Next, we are given a glimpse into a family crisis – the prospect of losing a child. I am convinced that this was not the only crisis in the life of the Holy Family. They too were not spared the turmoil, troubles and crises that affects all our families. Finally, we see the misunderstanding that takes place between the earthly parents of our Lord and His mission. It ends up with Mary rebuking, albeit gently, Jesus, and Jesus also mildly rebuking her in return. Mary (along with Joseph) remains perplexed. All she could do was to place these things alongside the others she had previously experienced, waiting for that day when the meaning of all this would become clear. So, our Lord went with them, back to Nazareth, to live with them, and in submission to their authority. Nevertheless, things would never be quite the same. Despite the divinity of the adolescent Jesus, and the saintliness of His earthly parents, their experience is not very different from ours. Just like them, God intertwines the human and the divine in our own experience. There is a kind of incarnation which is going on in the life of every Christian. You and I have the same struggles. 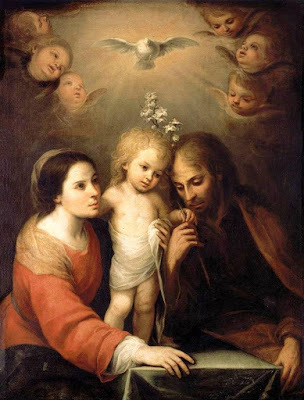 And so we can derive some important lessons from this strange, but all too human and yet mysteriously perplexing episode in the life of the Holy Family. Secondly, we will always experience a tension between our responsibilities to God and to human authority. Sometimes those responsibilities conflict so much that we must choose one or the other. Our Lord experienced the same tension and there were times He had to choose to serve God rather than man. Jesus reminded His parents that He was, first and foremost, the Son of God, in obedience to Him, and called to carry out “His Father’s business.” If God is our Father, then our ultimate obedience must be to Him, and not to any earthly authority, when the two are in conflict. Ultimately, Jesus makes it very clear where our ultimate allegiance must lie: “If anyone comes to me and does not hate his father and mother, his wife and children, his brothers and sisters -- yes, even his own life -- he cannot be my disciple” (14:26). It means that those of us who have children must, like Mary and Joseph, recognise that God may be leading them in a way that is painful and even costly to us, but which is nevertheless His will. As such, we should not stand in the way of our children following God. Thirdly, family life can be humbling. Sometimes we must often listen and even submit to those who are apparently our inferiors. It is rather amazing that Jesus would return home to Nazareth and submit to His parents who, though they loved Him, had no real grasp of who He was and what He was called to do. Yet He did submit and obey them because that was God's plan for the present. Don't be surprised if you are called to submit to an employer, a parent, a spouse, a teacher, a colleague, or a co-worker who is your spiritual, mental, or moral inferior or sometimes even to your own child. That, too, is part of Christian discipleship. Sometimes obedience is easy. But, majority of the time, let’s just be real: It’s very, very difficult. Finally, family life would be exceedingly difficult, if not impossible, if God is not part of the equation. As the prayer of St Teresa of Avila affirms, “He who has God lacks nothing. God alone suffices.” That is why it is so important that we are always in need of God's grace. There’s a famous saying attributed to Father Patrick Peyton, the founder and promoter of the Family Rosary movement, “The family that prays together stays together.” Ultimately, we are not dependent upon our skills or our wits, but God's grace. Yes, family life comes with its many challenges, pains and troubles. And let’s be honest that we would be tempted at times to just walk out hoping to run away from the pain and responsibilities. But notice, that our Lord was not trying to run away from His earthly parents. On the contrary, He was running to God, always running to God. So, whenever we are tempted to run from something, let us always run to God.